Jindas: Urban Regeneration in Lod was born out of Derech Lod, a citizen-driven initiative aiming to invigorate the city by attracting talented students and young professionals to live there. As the program’s first participants became familiar with Lod’s unique character, they understood that residents would need to play a central role in steering change and achieving greater prosperity for the city. One of Derech Lod’s founders established Jindas, an organization committed to Lod’s revitalization and the full participation of city residents in that process. Whereas many view Lod’s multi-cultural composition as an obstacle, Jindas considers the city’s unique history and diversity as among its greatest assets. Jindas is a truly grassroots organization working in close partnership with residents, the municipality and other key stakeholders. It has emerged as a leader in promoting Lod’s prominence and vitality, establishing the city as a model for success in Israel and beyond. Jindas is named after the ancient bridge situated at the entrance to the city, a symbol and a reminder of Lod’s legacy as a key destination in the center of the country. Jindas takes a simultaneously top-down and bottom-up approach to developing the Old City of Lod, including adjacent Ramat Eshkol and Neve Yerek neighborhoods. We work to fully assess the area's needs and potential, while also recruiting local stakeholders as project partners. Jindas' initiatives focus on five distinct but interdependent program areas: Economic Development, Housing, Community Relations & Education, Tourism & Environment. Together, activities across these platforms constitute a comprehensive development program. The city of Lod, located just 25 kilometers south of Tel Aviv, is one of the oldest, most culturally rich and diverse cities in Israel. First inhabited during the Neolithic Period, and in periods since functioning as a center for commerce and trade for the region, Lod maintained prominence under Roman, Mamluk and Ottoman rule. Several buildings from these periods remain in Lod's Old City including the Church of St. George, built by medieval Crusaders, an 18th-century olive oil factory and Khan Khilu; an Ottoman-era inn for travelers and merchants. 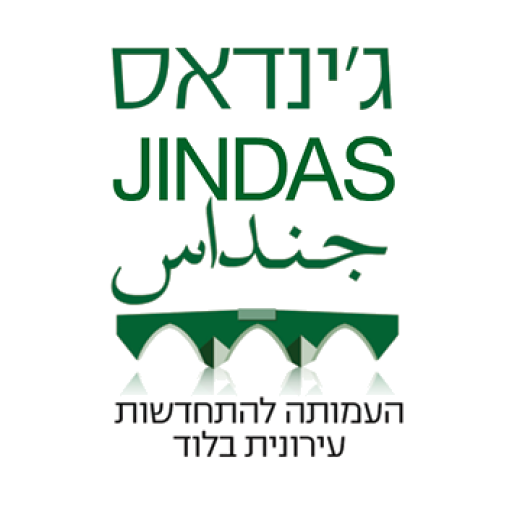 Jindas focuses its activity in the Old City of Lod, including the Ramat Eshkol and Neve Yerek neighborhoods. This target area is affected by a high unemployment rate, specifically among women, high crime rate and high concentration of public housing. For many, Lod symbolizes Jewish-Arab conflict and disparity between Israel’s rich and poor. Before the establishment of the State of Israel, Lod’s population numbered around 40,000 Arab residents. During the war in 1948, the majority of those citizens either left or were expelled from the city to many different places in Israel and the adjacent Arab states. Most of the buildings of historic Lod were destroyed. With only 3% of the Arab citizens remaining in the city after Israel’s establishment, the Israeli government designated Lod to absorb Jewish immigrants from all over the world. Many of these immigrants arrived with very little and struggled to integrate into Israeli society. Between the years 1970-1990 the State of Israel resettled Bedouin communities in Lod, as well as groups of families evacuated from Gaza. Today these groups represent the majority of the Arab population in Lod and face a number of acute social challenges. The city of Lod, located just 25 kilometers south of Tel Aviv, is one of the oldest, most culturally rich and diverse cities in Israel. First inhabited during the Neolithic Period, and in periods since functioning as a center for commerce and trade for the region, Lod maintained significance under Roman, Mamluk and Ottoman rule. Several buildings from these periods remain in Lod's Old City including the Church of St. George, built by medieval Crusaders, an 18th-century olive oil factory and Khan Khilu; an Ottoman-era inn for travelers and merchants. With a population of 78,000 Jewish, Muslim and Christian residents living side by side today, Lod is a true microcosm of Israeli society. Whereas Lod's cultural diversity is commonly perceived as challenging, Jindas believes it is one of the city's greatest assets. Over the last several decades, as Lod struggled to cope with municipal instability, poor urban planning, mass migration, and other related challenges, the city fell into a state of neglect. Though Lod has become a symbol of hardship and despair, its tremendous potential for revitalization, growth and positive change stems from its resilient residents and unique historical legacy. Jindas' founder, Avital holds a Mandel social leadership MBA and is active in a variety of organizations dealing with strengthening civil society in Israel. Ayelet holds a BA in English Literature and Linguistics from Bar Ilan University in Ramat Gan. Born in Lod, Aulfat has worked as an executive real estate consultant and is currently studying towards a graduate degree in Education. Yigal is a licensed attorney with many years of experience in resource development for a variety of NGOs. Mor has worked as a community organizer at the Housing Clinic, Tel Aviv University, and was founder and chairwoman of “Osim Shinui” – a national student movement. Ingudai immigrated to Israel from Ethiopia aged 16. She has worked with youth at-risk and as a guide for children with special needs. Betty Soibel is an intern with the Yahel Social Change Fellowship. Maha Shinawy was born and grew up in Ramat Eshkol, Lod and is the coordinator for Bayit Ham, Jindas's after school program for at-risk youth. Yifat brings to Jindas experience in economics and development from her prior work in Hi-Tech.